[AUTO](RC):When this unit's attack hits a vanguard, choose one of your «Dimension Police», and that unit gets [Power]+3000 until end of turn. ...Dailady is probably the one Dimensoinal Robo that is least used. Why? Well, it's because the Dimensional Robo legion is already so supported that there's practically no need to play this, but with that in mind, let's take a look at her. 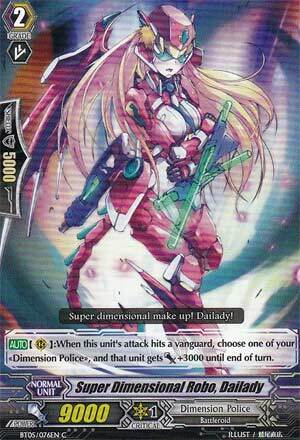 Whenever she hits the Vanguard (as rear-guard only mind you), you can give another Dimension Police unit +3,000 power. A few clans have their own variants of this card like Neo Nectar for example, but the one thing that makes this one slightly superior than the other clan counterparts is that she is a Dimensional Robo, and anyone that knows better knows that sometimes, it's just a matter of being part of a Legion that can tip things to your favor. The downside, however, was what I mentioned earlier: with the immense amount of support that Dimensional Robos have and will soon receive, there's really no room nor reason to play this. The 3,000 power boost is nice, but most Vanguards need to get a 4,000 boost or higher to unlock their abilities, so this just makes them a bit off from getting their effect. Also, since this has to hit the Vanguard, if they check a trigger as damage, then that makes this effect practically pointless. Overall, this card had potential when this came out, but now, it's rarely used for a reason. Next Time: When you go swimming, don't forget your swimpants.